It's Sunday, so it's time for another Cupcake Inspirations challenge. 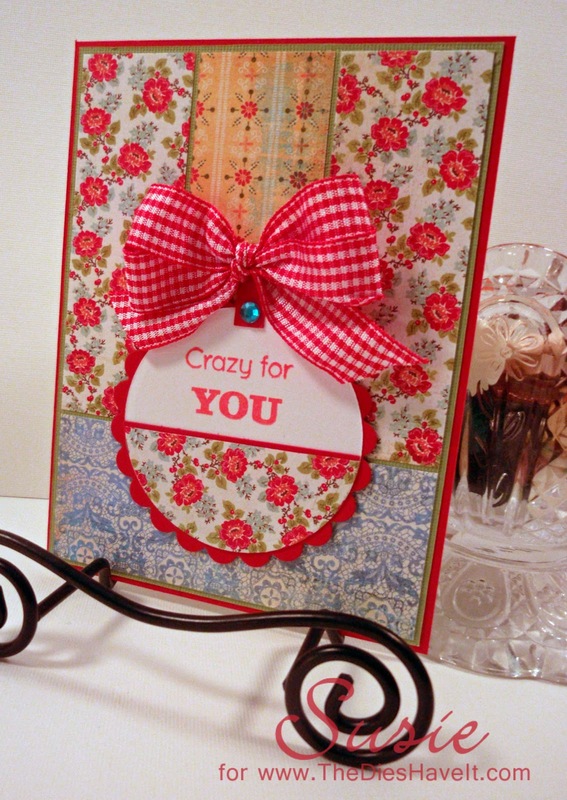 I made this card using the Basic Grey Picadilly 6x6 pad. I love just grabbing different sheets of paper and mixing them. The key is to always have a solid color between the patterns. To make the focal point, I cut two circles - one from white paper and one from patterned paper. I cut the patterned paper circle in half and add a tiny red cardstock border to it before adhering it to the white circle. Then I stamped the sentiment. I used Spellbinders dies for the circle and the scalloped mat. Easy peasy. Here is our inspiration challenge for today. Be sure to create a card and upload it for your chance to win this week's prize. I hope I'll see you tomorrow. I have another layout to show you and I am very excited about it. Wow , you are good at choosing papers, these are all so different but realy go together. the Bow just makes it all "pop". Beautiful card! I love that flowered paper. Susie, it's beautiful, I love the combination of the papers and the yummy bow. They look gorgeous together.